ToyoScreen chromatographic process development columns are an easy to use screening tool for resin evaluation. Parameters such as selectivity, binding capacity and recovery are key factors to succeed in chromatographic purification. ToyoScreen provides a convenient way to screen TOYOPEARL® resins, a packing material for semi-preparative and preparative liquid chromatography, and to developing the purification conditions of your biological target molecule. ToyoScreen consists of small pre-packed screening columns packed with TOYOPEARL. 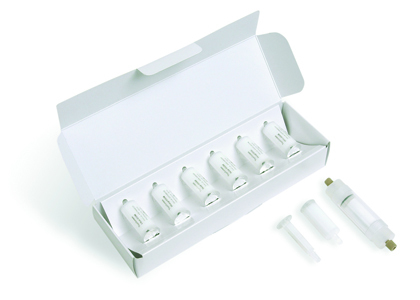 They are available with 1 and 5 mL resin volumes for hydrophobic interaction (HIC), ion exchange (IEC) or affinity chromatography (AFC) and can be connected to most laboratory chromatography systems. ToyoScreen RoboColumns® are the latest addition to the ToyoScreen family. RoboColumns are miniaturized chromatographic columns for automated small-scale biochromatography. They are available with 200 and 600 µL resin volume and can be operated with an appropriate robotic liquid handling system.